Some of you may or may not know the term “paraphrasing”. This term is widely used by the students in order to avoid plagiarism act. 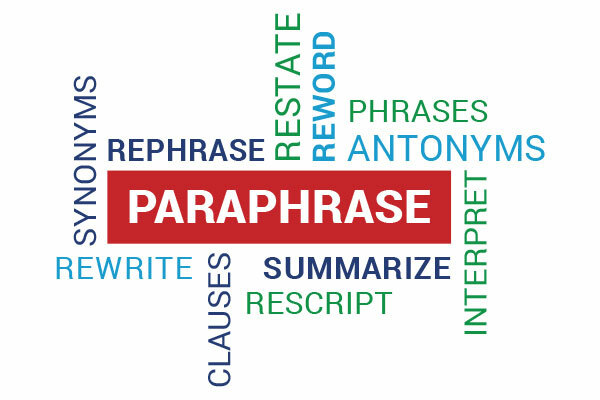 Before continuing, it will be better to explain what paraphrase is. If we look in Merriam Webster Dictionary, Paraphrase (noun) \ ˈper-ə-ˌfrāz, \ is a restatement of a text, passage, or work giving the meaning in another form. 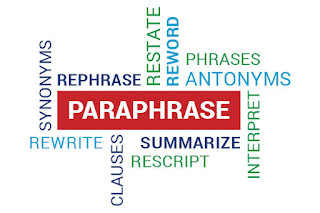 It means that paraphrase is an act of making another version of text, message, passage, or what other people has said or written without changing the meaning. In fact, without we realize, we always do paraphrase in our daily life. Let’s take a simple sample, when you tell your friend about what someone else had said, without you realize it, you always do paraphrasing. Read the original passage until you understand the meaning, if you don’t read the passage again. If you get the meaning, starts writing on a note about anything that you understand but remember don’t look the original passage. Check your paraphrase with the original one and see whether your paraphrase has expressed all the information or not. Use quotation mark to identify any term that you have taken exactly from the source. Don’t forget to record the source so that you can credit it easily. "Exercise can help a lot in alleviating stress – that is a known fact. Exercise is a good way in reducing stress, and cardiovascular exercise is recommended for about 15 to 30 minutes, thrice or four times a week. Several studies have indicated the effects of exercise in handling stress. The activity can release endorphins to the blood stream." "Exercise is a good way to get rid of stress. It is also a perfect way of lowering stress levels, while cardiovascular exercises that can be done three or four times a week for about 15 to 30 minutes is highly suggested. Research shows that there are positive effects of exercise in dealing with stress. It can help in releasing endorphins in the body." If you somehow confuse in paraphrasing, let’s start from the simple one. Train your paraphrasing skill from a sentence to sentence. It takes a while but it worth to train. Happy Paraphrasing guys!!! Stay Close Together, merupakan acuan yang merepresentasikan nilai dan tujuan dari lembaga kami yang berorientasikan kebersamaan dalam memperoleh ilmu pengetahuan.